I've been working on a baby sweater for one of my friends. Her third child is due in a few weeks. I wanted to make her baby to come something to wear. Usually I knit hats. They are easy, quick to knit, and babies always need to stay warm especially in the colder months. I began several hats. All have turned out not quite right so those will just be given to other little ones. I decided to try making her little boy something to wear on his body. I searched through many patterns before settling on one that looked perfect. I am a woman of practicality. I know that there are many super cute things to knit for children. Many are amazing knits that will dazzle you with cuteness. I was tempted to knit some of those items but when I think about how I clothed my children it all came down to comfort and ease of wearing. Considering those factors I narrowed my search to a pattern for a cardigan. It is a compromise between adorable and practical. I can't wait to see how it turns out. I have about a third more to knit before it's done. 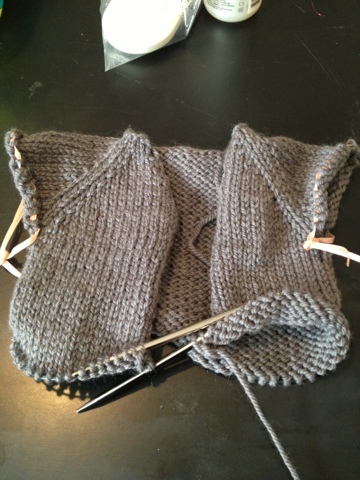 So far it has been simple to knit and looks like it will wear perfectly.